Hey everyone! 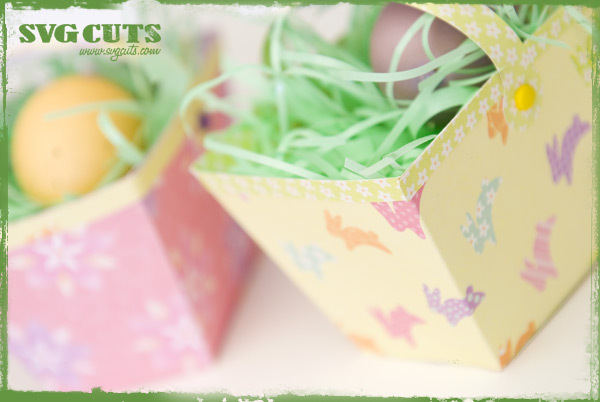 Today's free SVG is an adorable Easter Basket Placecard Holder, perfect for your Spring and Easter gathering! Add joy to your breakfast or bring one for everyone to a dinner party or luncheon and be the talk of the holiday! This is a one of a kind element that is only available on our blog! 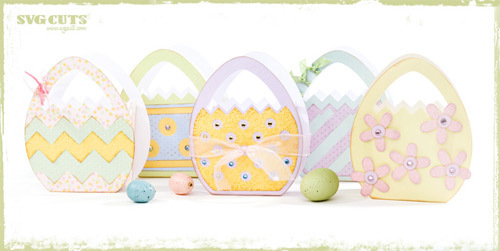 Visit the Easter section of our store for more Easter related cuts! 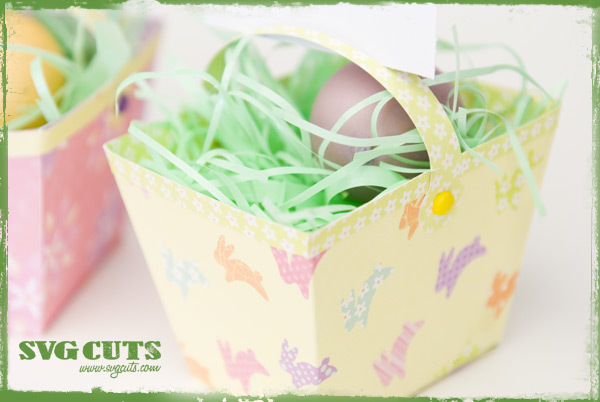 Fill each basket with a real dyed egg or with candies or a plastic egg filled with treats or a handmade gift. Print names using your printer and cut apart into rectangles or cut rectangles with your cutting machine and write the names by hand. We sized our SVGs to 11.3" wide and the baskets are about 3.5" tall, perfect for a 2.75" x 1.75" name card. We used Easter paper from a K&Company Seasonal Paper Pad which is double-sided, so we flipped the optional basket trim over for some contrast. 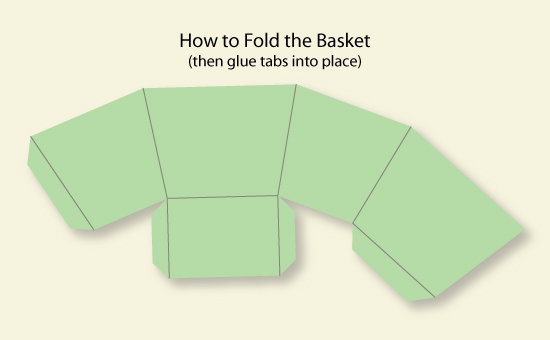 We poked slits with an Xacto knife and inserted a brad to attach the handle to the basket. All downloads are in Zip format and include the .svg files for use with your Sure Cuts A Lot (SCAL) software. If you like this file, please leave some feedback below! Oh I love these! I can’t wait to make them for my family’s Easter breakfast! Thank you, thank you, thank you! Great for my Easter table!!! You guys are wonderful…. These are amazing. Thank you so much. I just love these free files! 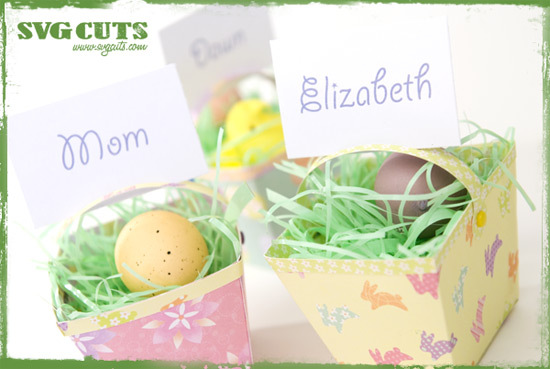 This Easter name tags are so adorable! Thanks guys! I like the idea of the slot over the handle for the name cards – good idea! I love it! I am going to use it to make mini easter baskets. Too cute! Thanks again for all your great files. I love this. Would be so cute on the Easter Table. Just made 12 of the easter nametag baskets for the Bunco girl’s Easter Bunco at my house! THANKS so much for the free treat! With 13 grand children and 9 great children I know i am going to get a lot of use out of this one, thank you so much. Guess I had better get started or easter will be over before I get them done. thanks again. Thank you! Very clever with many possible variations. These will be so cute for my easter egg hunt for my neices! The Easter basket is adorable! I am making them to give to the folks who work in my husband’s office and mine. Just a little something to spread the joy of Easter. Thank you so much for sharing your talent! Very cute, and it looks like they would be quick to make in multiples. Thanks. Oh my gosh! I just made these and they turned out so cute!! The cuts are exactly where they need to be, no trimming. Thanks so much for sharing with us! I love having little gift boxes and baskets. Thanks heaps. Good to know (Amber) that they turned out really well. Is the handle file missing?